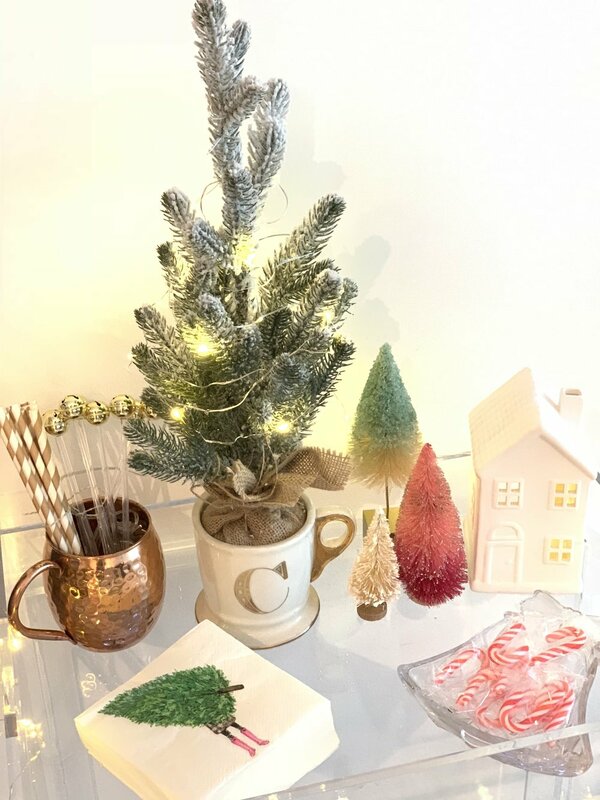 Jingle Bell Stir Sticks // Sugar Paper Company has the most adorable holiday decor and bar cart finishes at Target each holiday season. I grabbed these adorable bell stir sticks for cocktails to place on my holiday bar cart and love that they’re a real jingle bell! Gold Bow Napkin Rings // I also picked up these gold bow napkin rings from Sugar Paper Co. that could be used year round. I have a lot of accents with gold throughout our space so these were the perfect touch for the plaid napkins I put together for our table setting. These place card holders would also be perfect for a more formal gathering and are match with the cocktail stir sticks! Marble Coasters// These are a favorite of mine that also make a great hostess gift. Mini Tree 🌲 Target they come in 3 different sizes small fits perfect into the mugs and I did this as a gift for a few friends this year. Now is the time to stock up and they’re great for thin fireplace mantles or window sills. Bottle Brush Trees// pink one was old from Target dollar section and the green and white ombré is Pier One. Ceramic House// I love these ! Perfect for winter vignettes and glow with a tea light inside. All of mine are from Target but Michaels and Hobby Lobby also sell similar. My mug is old from Anthropologie but this year I found a cute plaid print mug I gifted from Pottery Barn. They’re marked down to $5 right now! This is a super long post but I’ve rounded up so many items that are marked down for end of the season and could easily be used next year or saved for gifts! I often will use Bath and Body Works as my go to for candles to make the place smell festive along with hand soaps. Lately I’ve been finding some of my favorite home candles from TjMaxx or Marshalls. This is also where I found so much of my holiday decor like the reindeer stocking holders, stockings, trees. A lot of the terrariums I use on my window sill and shelves are from Hobby Lobby. 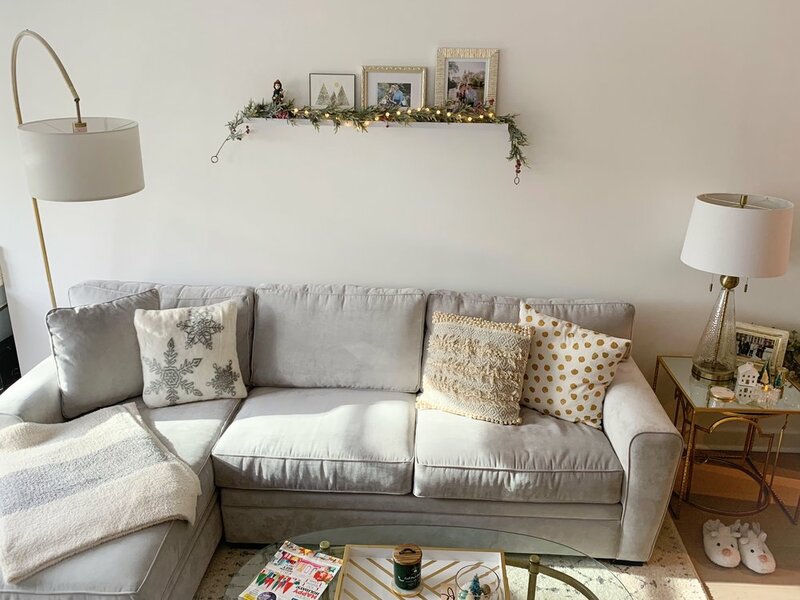 I had shared some of my favorite home decor pieces in this blog post. I had grabbed a few neutral pillows for winter from Pottery Barn & the golden snow flake one is from Michaels. Target also has this cute option. I usually opt for pillow covers that way I can interchange between seasons and not have to store a bunch of plush pillows. I found mine at Pottery Barn on sale. Right now is the best time to snag any holiday decorations since much of it is on clearance! Target has up to 70% off and Homegoods / TjMaxx also has 50% off all holiday too. I usually stock up on wrapping paper, gift bags, and house warming gifts. Other great finds on sale are the ornament and wreath storage boxes to store it all away. I usually leave most of our decor up through the new year since we travel over the holiday and want to enjoy it for a few more days. My favorite piece is our monogrammed mirror friends designed for us from our wedding. I love how it fit seamlessly into the space and is so personal to us! Stocking Holders & Stockings// TJMaxx Then I found this silver style on sale at Pier 1! Perfect gift for newly weds or new home owners for next season too. Our Tree’s ribbon is from Shop Hello Holidays and it is the best quality! I had heard another blogger, Emily Ann Gemma rave about it so I caved and got some of the rolls on sale. They sell out quick but I know I’ll have it for years and it really adds a great touch to the tree! Each year Kevin and me go to the Bryant Park Holiday Market shops and pick out an ornament to customize together. Since this year we’re in our new place we had to get a front door ornament. I love this tradition we’ve done for over 7 years now! Rug / Wayfair Absolutely love the soft and modern look of this rug. It’s soft without being rough and complimented our couch too. Barefoot Dreams Throw Blanket Super cozy and soft a favorite of mine and any guest that visits us! Makes a great house warming gift, along with the marble coasters. Fur Throw / a heavier one that is so soft on each side from Pottery Barn. It washes and wears so well and is on major sale! If you have any questions about any of the items or there’s something missing let me know! I would love to have your thoughts so I can re work our decor for next Christmas. Wishing everyone a restful holiday season and merry wishes for a healthy and memorable 2019!